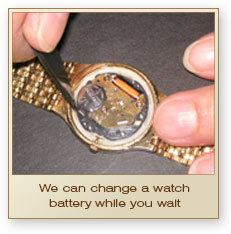 We carry all types of watch batteries, 63 sizes in all, and can change a watch battery while you wait. We also keep most sizes of watch crystals and water seals in stock and most repairs can be done in one business day. It is strongly recommended that you do not replace batteries yourself, as special tools are required to open the watch case without damaging it.